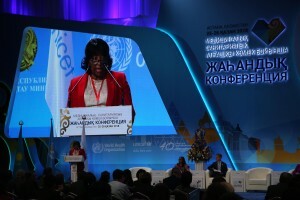 Health is a human right, and it is governments' responsibility to ensure that right, said the Director of the Pan American Health Organization (PAHO), Dr. Carissa F. Etienne, on October 26th, during the closing session of the Global Conference on Primary Health Care in Astana, Kazakhstan. "Health is not a privilege, nor a commodity. It is a fundamental human right," said Etienne, adding that "national governments must lead and own national processes towards universal health, in coordination with partners." The Global Conference on Primary Health Care, held October 25-26, was organized by the World Health Organization (WHO), UNICEF and the Government of Kazakhstan and was attended by representatives of governments, nongovernmental organizations, international agencies, academic institutions and youth organizations. "We know what works and what we need to do," said Etienne, referring to what is known as the Primary Health Care (PHC) strategy. Based on the principles of equity and solidarity in health, the PHC strategy was first endorsed by global health leaders 40 years ago in the 1978 Declaration of Alma-Ata, signed in the city that served as Kazakhstan's capital until 1997. During the Astana meeting, delegates from more than 120 countries—including many from the Americas—reaffirmed their countries' commitments to PHC and signed the Declaration of Astana, in which signatory countries pledge to strengthen their primary health care systems as an essential step toward achieving health for everyone, everywhere. Universal health is also called for in the United Nations' Sustainable Development Goals (SDGs). PHC is a strategy for human health and well-being and social development that is centered on people, their families and communities. "It is not merely the first level of care, nor it is the provision of a limited package of services for the poor," said PAHO Director Etienne, who also serves as WHO's Regional Director for the Americas. Primary Health Care envisions universal access to comprehensive and quality health care services that focus not just on curing diseases but also on prevention, rehabilitation, and treatment. The strategy also calls for addressing social determinants of health such as poverty, education and housing. Etienne noted that PHC also requires breaking down barriers to access to health, including financial, geographic, and cultural and gender barriers. It also seeks to overcome the fragmentation and segmentation of health systems and services. All this "requires State action," said Etienne. "Without State action, there is no right to health, especially for those living in situations of vulnerability." She urged governments to listen to the voices of those who have lacked equitable access to health, to better understand their needs and to strengthen their participation and commitment to be able to develop a model of care centered on people and communities. PHC should be central to countries' efforts to transform their health systems in order to advance towards universal access to health and universal health coverage. As a key step toward universal health, said Etienne, "we need a revolutionary first level of care" that offers comprehensive health services located where people live and work. That first level of care should make rational and efficient use of technology and organizational innovation, including interdisciplinary health teams with a new cadre of personnel and skills mix. It should be supported by an integrated health services delivery network, including hospitals and specialized services, and should be able to respond to risk factors, violence, mental health issues, sexual and reproductive health, chronic noncommunicable diseases, and disasters, among others, said Etienne. Everyone has a role to play in advancing universal health, said Etienne, including governments, young people, women, the private sector, academia, development partners, community leaders and people everywhere. She urged all these actors to accelerate their efforts going forward. Etienne said governments should take the lead by adopting coherent policies and regulations and by investing in health. "Please do not reduce health to minimum sets of packages of essential services, when your peoples deserve so much more!" she told government representatives, adding, "Invest in your people and your systems; invest in health, not war." PAHO's Director challenged young people to become more involved in health, saying, "You are our future, the energy that will drive change." She called on women to urge leaders to ensure that gender is central to decision-making in health. And she challenged academicians to invest in operational research that is context specific and focused on the needs of countries and the health systems, to provide evidence that will guide and support policymakers to take the right decisions. Etienne also recognized the role of the private sector as health care providers and their importance in innovation and technological development. Emphasizing the principle of social responsibility, however, she urged that the private sector "Innovate, but based on health needs." Addressing development partners, Etienne said that the Declaration of Astana and the SDGs offer a "golden moment" that must be seized. "We cannot leave here and repeat the mistakes of the past" by reducing primary health care to minimum sets of poor services for the poor. "There is no other way" than PHC to achieve health for everyone, everywhere, said Etienne. "Primary Health Care is smart. Primary Health Care is right."